Meili Snow Mountain 梅里雪山 is located in Deqin County. This beautiful mountain range is comprised of 4 four large glaciers: Ming Yong 明永，Si Nong 斯农，Niu Ba 纽巴, and Nong Song 浓松. 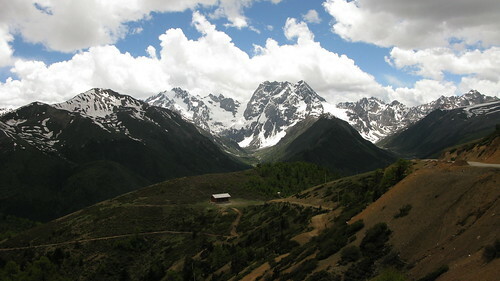 The average altitude is at 6000m with Ming Yong being the highest at 6750m, the highest in Yunnan Province. While it’s not as high as Mt. Everest’s 8000m, it had certainly proved to be a more difficult climb. There had been 9 failed attempts with a major casualty in 1991 of 17 Sino-Japan climbers. 3 more attempts were made after to search and rescue but with no success. In 1996, climbing has been banned completely. I’ve always chose ocean over mountain adventure. I’ve actually never trek before even if Philippines has some of the most beautiful and climable mountains. However, this one time I was talked into doing an “easy” trek. This breathtaking view outside the bus window of a 9-hours ride from Shangrila to Deqin convinced me it’s probably worth a try. Little did I know that the couple of days that follow will be bumpier than this ride. No actually the ride isn’t so bad and it only costs RMB43 (USD7) per person. When we arrived Deqin, it was already late in the afternoon. We didn’t make arrangement for lodging so we just followed the other travelers to Tashi Mountain Lodge in Reringkha village. It was a quaint little place where the backpackers hang out in the TV room. It was run by one girl, Maria. She cooked food while everyone (20 people) helped out in peeling and later washing. She went shopping and was surprised to find 8 new boarders she had to prepare food for. She took us in anyway. There’s a trekking diary in the den where any guest can add to it. There are various exploratory trek entries. 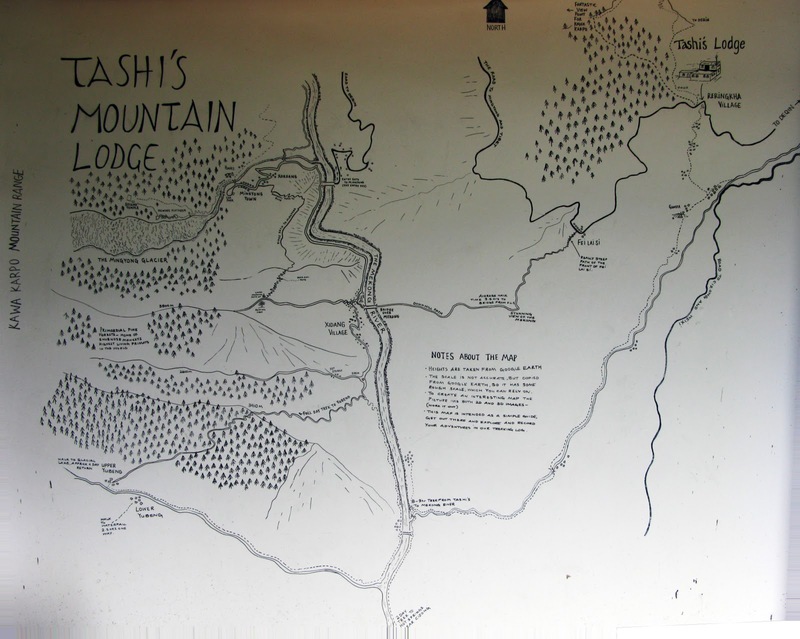 And so our quest to hike from here to the viewing deck of Meili Snow Mountain will all be based on this logbook and 2 wall drawings in the guesthouse. Good luck indeed. We asked Maria to prepare 2 packed lunch for us to bring the next day at 8am. We also packed a smaller bag and left the big one with her. IF the map is accurate, we should be in Ming Yong village in the valley by 4pm the next day. It is unfortunate that Tashi already closed down due to the road widening project, but I’ve noticed there were new hotels and guesthouses being constructed across Fei Lai Si in 2008. Well I love mountains and am into it. I like also the ocean. Someday I will dive also. Hopefully soon. These snow capped mountains are lovely. Hope to visit them someday and will ask you for some personal tips. I'm not really a mountain person either and I'm from Colorado, land of the Rocky Mountains. This sounds like an interesting mountain range though, kind of like second place to Everest, so it doesn't get as much attention.